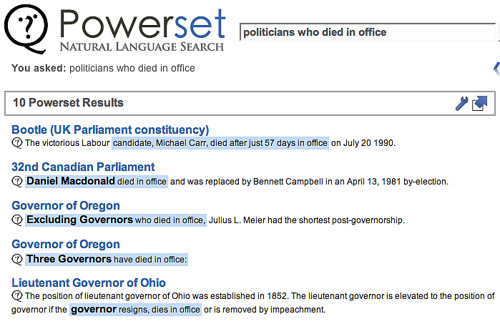 Did you know Powerset’s Wikipedia search and innovative interface is available in Bing? It is the reference vertical. For some reason I hadn’t noticed this even though there were some announcements. The original word went out on July 27th but there doesn’t seem to have been much reaction. The connection between Bing and the reference vertical is via the ‘Enhanced View’ link in the Bing SERP. One of the best things about Powerset is its Factz feature. If you look at a page for a movie, you can see a pretty neat, completely automated summary of the plot. Have a look at Star Wars. Powerset is proving that it is not only chock full of NLP and CompLing ninjas, but also is not too shabby when it comes to online promotion. Powerlabs is a program for developers which gives them access to Powerset capabilities - it is also a channel through which anticipation can be built. 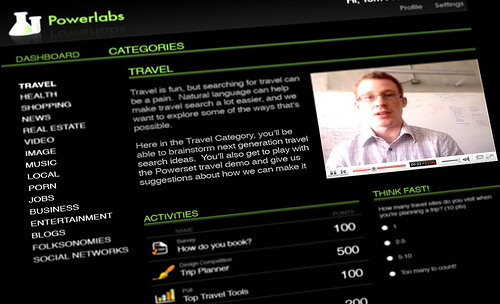 Yesterday, Steve Newcomb posted a screen shot of the Powerlabs interface. Before he did this, he pushed some pictures out to the Powerlabs group. For example, Norvig said, researchers are looking for ways to break down sentences by looking for a phrase like "such as" and grabbing the names that follow it. The goal is to not only pull out the name but also its clusters, so that a name such as "Java" can be associated both with the computer language and with language in general, Norvig said. "We want to be able to search and find these [entities] and the relationships between them, rather than you typing in the words specifically," Norvig said. I mean - couldn't you build a next gen search engine on such wonderful ideas? VentureBeat (once a critic of Powerset, now more of a believer) covers the story. In summary, Powerset's technology is not some rushed together start-up demo, but the result of many man years of research and development at PARC. VentureBeat's post contains an interview around the topic of NLP with Google's Peter Norvig. While Norvig gives some insight into the work on NLP at Google, he doesn't mention one of their main areas of focus: machine translation (MT). It is interesting to learn of his caution in the area of NLP for search while they are tasking a number of scientist at MT, possibly the hardest AI problem known to man. I'm tickled by the new Powerset site. 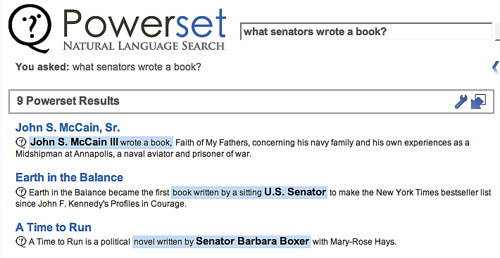 Powerset is doing something that really excites me - applying natural language processing to the problem of search. The reason the new site is of interest to this blog is partly due to that, but also due to the fact that they redesigned the site in part to be better positioned to respond to blog conversations about their company. A little over a week ago, Powerset was at the centre of a moderate blogstorm in which various pundits traded views on the value and promise of natural language search. At that time Barney Pell (CEO) responded on his own blog, as did a few other Powerseters. With the new site, they have both a press release section and a corporate blog at the ready. Consider Powerset, the secretive search startup backed by A-list angel investors, including PayPal Inc. (EBAY ) co-founder Peter Thiel and veteran tech analyst Esther Dyson. Co-founder and CEO Barney Pell harbors ambitions of out-Googling Google with technology that he says would let people use more natural language than terse keywords to do their searches. By analyzing the underlying meaning of search queries and documents on the Web, Powerset aims to produce much more relevant results than the current search king's. Problem is, Powerset's technology eats computing power like a child munches Halloween candy. The little 22-person company would have to spend more than $1 million on computer hardware, two-thirds of that just to handle occasional spikes in visitor traffic, plus a bunch of people to staff a massive data center and write software to run it. That's when Pell heard about Elastic Compute Cloud. He was sold. Based on tests so far, using the Amazon site for part of the company's computing power could cut its first-year capital costs alone by more than half. Briefly, Barney summarises the discussion (very diplomatically ;-) and Lorenzo writes a great first post on the potential and promise of natural language search. Missing from the discussion so far is a broad view of the index side component of NLP search infrastructure - the really interesting part. It is unfortunate that critics are focusing on the behaviour of users (will they or won't they write natural queries) and the ability of the search service to interpret those queries (can they automatically understand and encode the subtle differences?) rather than the more interesting issue of a system that can ingest all the data on the web in a manner that could be called interpretation. Perhaps the only relevant writing on this aspect so far as been the mention of clustering technology such as Vivisimo's which gives the appearance of (a certain class of interpretation - that of word sense) post hoc. You can see the conversation graph rooted at Barney's original post here.